"I may not be one of your fancy Hollywood frogs, but I deserve a chance!" In the mid-1970s, Jim Henson brought his alter-ego Kermit the Frog from Sesame Street to the small screen, with a whole new cast of supporting characters. The Muppet Show became a major hit in syndication, and in 1979, The Muppet Movie brought the now-familiar characters to the silver screen. The story is simple�Kermit (Henson), playing his banjo and singing in his swampy home, is discovered by a talent agent (Dom DeLuise), who urges him to travel to Hollywood for a major frog audition. Kermit sets out on his bicycle, and his party grows along the way as he meets Fozzie Bear (Frank Oz), Gonzo the Great (Dave Goelz), and Miss Piggy (Oz). Kermit's perseverance is tested by the evil Doc Hopper (Charles Durning), a fast-food frog legs magnate who desperately wants Kermit as his advertising spokesfrog, aided by his nephew Max (Austin Pendleton) and a deadly frog-killing assassin (Scott Walker). The newfound friends encounter many familiar Muppet characters�psychedelic rockers Dr. Teeth and the Electric Mayhem (Dr. Teeth�Henson, Floyd�Jerry Nelson, Janice�Richard Hunt, Animal�Oz, and Zoot�Goelz); Dr. Bunsen Honeydew and Beaker (Goelz and Hunt), and Sweetums (Hunt), the massive, ogre-like full-body Muppet. Numerous human actors turn up in comic cameo appearances, with memorable turns by Madeline Kahn, Steve Martin, Richard Pryor, Milton Berle, Mel Brooks, Carol Kane, Bob Hope, Orson Welles and Cloris Leachman, among others. Ventriloquist Edgar Bergen (to whom the film is dedicated) makes his last screen appearance with Charlie McCarthy, effectively passing the torch to Henson and company as the next generation of American puppeteers. Unlike the later Muppet films, which generally cast the characters in story-driven roles, The Muppet Movie lets Henson's fabric-and-foam characters be themselves. Kermit is good-natured but determined, Fozzie is funny only when he's not trying to be, Piggy is too self-centered to acknowledge her true feelings for Kermit, and Gonzo is... bizarre. There's an appealing looseness to the story's road-movie structure, with plenty of opportunity for sight gags and verbal jokes that work more often than not. The story also allows for emotional content unseen on The Muppet Show or in most of the other Muppet movies; Kermit's struggle with impending failure and Gonzo's touching campfire song (I'm Going To Go Back There Someday) are great moments that truly transcend the constraints of puppetry. Paul Williams and Kenny Ascher contribute several great songs to The Muppet Movie�The Rainbow Connection has become a standard, Movin' Right Along is almost unbearably catchy, and the Rowlf the Dog-Kermit (both Henson) duet Somethin' Better is a wonderful, barrelhouse piano man-song. James Frawley's direction is stylish and joyful in a very 1970s manner, and the merging of Muppets and humans works better than might be expected, despite obvious differences in scale. The Muppet performers are in fine form as well, delivering excellent work under physically difficult conditions (five Muppets in a car with six or more Muppeteers and a driver crammed in below camera level, for example). Technical wizard Faz Fazakas achieves some impressive special effects, with Muppets riding bicycles, playing piano and otherwise pushing the envelope. Ultimately, The Muppet Movie works because it doesn't try to be a big Hollywood production or a merchandising juggernaut. It's a simple, sweet, rags-to-riches, follow-your-dreams kind of story, the sort of movie that long ago fell out of favor in live-action form but works very well with the Muppets. Zany, self-referential humor, colorful, substantial characters, and terrific songs make this one a classic. Great stuff from the best in the business, and suitable for all ages to boot. Image Transfer Review: Columbia TriStar presents The Muppet Movie in its original 1.85:1 widescreen theatrical aspect ratio, drawn from a fairly clean source print in anamorphically enhanced format. The image suffers a bit due to 1970s grain and softness, obscuring textures to some degree, but color is very solid and the digital transfer is free of distracting compression artifacts. Edge enhancement shows up in a few shots, and some restoration may soon be in order, but the widescreen DVD transfer generally presents the film faithfully. 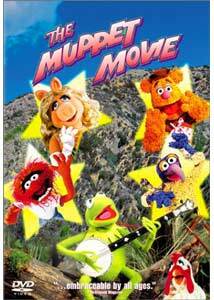 Audio Transfer Review: The Muppet Movie features four soundtrack options�original English Dolby 2.0 Stereo, an English Dolby Digital 5.1 remix, and French and Spanish 2.0 monaural tracks. The analog soundtrack sounds dated, with dialogue distortion, volume variation and muddiness here and there, and high and low frequencies are not well-represented. The engineered 5.1 remix provides greater envelopment where Paul Williams' terrific music is concerned, but dialogue and most sound effects stay centered in the spirit of the original Dolby Stereo mix (in a throwback to the early days of DVD, the disc defaults to the 2.0 presentation). The French and Spanish mono tracks benefit from appropriate voice casting, and lip-synch inaccuracies aren't a major problem for the Muppets. Overall, an accurate DVD representation of a late-1970s soundtrack. Prior to production of The Muppet Movie, director-to-be Jim Frawley joined Jim Henson, Frank Oz, and Richard Hunt for a day of "screen tests," in order to see how the Muppets (previously recorded on video and film-for-television under controlled studio conditions) would look in the great outdoors under natural lighting. Henson's Kermit, Oz's Fozzie Bear and Miss Piggy, and Hunt's Sweetums (the big, ogre-like guy) have a lot of fun improvising for the camera. Highlights include Fozzie's search for a bathroom in the car, Kermit and Piggy arguing over a "dream house" in the English countryside, and Kermit and Fozzie discussing the nature of their foam-rubber, fake-fur, boneless existence. The off-the-cuff footage suffers from faded color and awful sound, but this loose, funny, oddly poignant material is a valuable piece of Muppet history and a true DVD treasure. Three brief television spots from 1999, starring Kermit the Frog, Miss Piggy, and a few Muppet performers of more recent origin, Pepe the King Prawn and Rizzo the Rat. These are nicely put together in MTV-ish sound-bite style, placing the Muppet characters against plain white backgrounds and letting them be themselves for a few minutes. Fun stuff, nice to have on DVD. Five trailers for Muppet/Jim Henson-related films include Muppets from Space, in 1.33:1 pan-and-scan, Dolby Digital 5.1 format; Jumanji, 1.33:1 pan-and-scan, Dolby 2.0 Surround; Buddy, 1.66:1 letterboxed 4:3 (from a videotape master), DD 5.1; The Muppets Take Manhattan, 1.33:1 (VHS TV promo), 2.0 mono; and The Adventures of Elmo in Grouchland, 1.33:1 pan-and-scan (video master), DD 5.1. Unfortunately, the trailer for the original Muppet Movie is not included here, and these bonus trailers aren't presented as well as they might have been. The Muppet Movie is a marvelously joyful comic adventure from Jim Henson, with great songs and plenty of kid-appropriate, adult-friendly humor. Columbia TriStar's DVD presents the film well with some valuable supplements. Highly recommended for all ages.